U.S. National Security Advisor John Bolton visited Moscow on June 27 to lay the groundwork for the first full-fledged meeting between Russian President Vladimir Putin and U.S. President Donald Trump. While in Moscow, Bolton was received by Putin and held meetings with Foreign Minister Sergei Lavrov and Russian Security Council First Deputy Secretary Yury Averyanov. Bolton told Russian and foreign journalists about the results of his visit to Russia during a press conference at Interfax’s main office. “[U.S.] President Trump asked me to come and speak to Russian authorities about the possibility of a meeting between him and President Putin,” Bolton said. Trump believes that his meeting with Putin will benefit both countries and help strengthen peace worldwide, despite all of the political noise, he said. “A lot of the president’s critics have tried to make political capital out of theories and suppositions that have turned out to be completely erroneous,” Bolton said. “But I think the president determined that despite the political noise in the United States, that direct communication between him and President Putin was in the interests of the United States, in the interests of Russia, and in the interests of peace and security around the world,” he said. There’s nothing unusual about the upcoming meeting; both leaders believe it is important to discuss issues of mutual concern, Bolton said. “Both President Trump and President Putin feel that it’s important for these two leaders of these two critically important countries to get together and discuss their mutual problems and areas of cooperation. It’s something that I think both feel will contribute to improvements in the US-Russia bilateral relationship and in stability around the world,” he said. He pointed out that over the past year, Trump met with the leaders of the United Kingdom, Germany, France, Greece, Finland, Austria, and other countries, and Putin had meetings with many European leaders. Bolton described the Kremlin’s reported ties to Trump’s electoral campaign as nonsense. “Well, I think a lot of people have said or implied over time that a meeting between President Trump and President Putin would somehow prove some nexus between the Trump campaign and the Kremlin, which is complete nonsense. But I don’t think that’s been helpful and as I say, I think the president recognizes that there may be some criticism of this decision to have the meeting,” he said. The Trump administration is not paying attention to “political criticism at home” over the upcoming summit, he said. “But what must guide his conduct of American foreign policy is the pursuit of American national interest. And he judges – correctly, in my view – that this bilateral summit between himself and President Putin is something that he needs to do,” Bolton said. 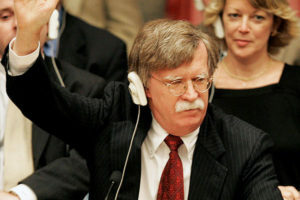 At the meeting, Trump will raise every pressing issue in relations between the two countries, including the situation surrounding Crimea, the MH17 crash investigation, Russia’s alleged interference in the U.S. election, and the state of affairs in Syria, Bolton said. “I think he’s going to raise the full range of issues between the two countries,” he said. Other topics could include strategic stability, arms control, including New START and the Intermediate-Range Nuclear Forces (INF) Treaty, and missile defense problems, Bolton said. Trump may revisit the issue of returning Russia to the G7, he said. “I can say today we didn’t discuss the G7/G8 idea, but I don’t exclude that the two leaders could talk about it when they meet,” he said. The United States’ position on Crimea and the need to maintain anti-Russian sanctions remains unchanged, according to Bolton. “That’s not the position of the United States,” he said when asked whether Washington recognizes Crimea’s accession to Russia. “Well, the subject of the sanctions did come up in the meeting with the [Italian] Prime Minister [Giuseppe Conte] yesterday, and I told him that the U.S. position remained that the sanctions should stay in place,” Bolton said. Washington does not expect specific results from the summit; the mere fact that high-level negotiations will take place is important, Bolton said. “I don’t think we expect necessarily specific outcomes or decisions. I think it’s important after the length of time that’s gone by without a bilateral summit like this,” he said. However, Bolton did not rule out that specific agreements could still be reached following the summit. “I think the fact of the summit itself is a deliverable, and I don’t exclude that they will reach concrete agreements,” he said. “There are a lot of issues to talk about,” he said. The presidents could meet “either in the one-on-one or the expanded” format, he said. “We’ll follow their lead after that discussion takes place,” Bolton said, replying to a question as to whether the matters of arms control, including with respect to New START and the INF Treaty, were discussed during his meetings in Moscow and if Washington expects specific decisions on issues in this sphere to be adopted at the summit. Russian Foreign Minister Sergei Lavrov and U.S. Secretary of State Mike Pompeo will hold a preparatory meeting ahead of the summit between the presidents, Bolton said. “So there will be other preparatory meetings. I don’t doubt that Mike Pompeo and Sergei Lavrov will get together, and I would expect there’d be other preparatory meetings as well,” he said. Russian President Vladimir Putin and U.S. President Donald Trump will meet in Helsinki on July 16, the Kremlin’s press service said in a statement on June 28. “As agreed, Russian President Vladimir Putin and U.S. President Donald Trump will meet in Helsinki on July 16. The current condition and prospects of further development of Russia-U.S. relations and pressing global affairs will be discussed,” the Kremlin said.